Amy Took the Words Right Out of My Mouth! - JP loves LIFE! Butcher Block with a Side of Farming! : Attention Twitterverse: Direct Marketers, Urban Farmers, New Farmers….You just might need a team of advisors. Okay, I have a really clear example of what Amy’s talking about. I tweet about agriculture, especially cotton (seems obviously with a handle like JPlovesCOTTON huh?) and things here and there (today the Liberty Bowl crowd snuck in). I’ve mentioned before that my brother and sister-in-law have a great, small farm in Ohio. The last few days, family and friends watched Facebook status updates as one of their nanny goats gave birth to twins and had real complications. Before we really had time to adjust to the fact the doe died, the twins died as well. It was obviously tough on Ray & Elizabeth — they brought the kids inside trying to keep them warm in the kitchen, tried to get them to bottle feed, etc. 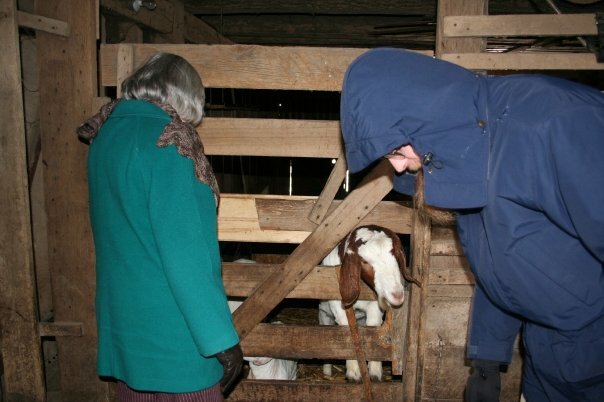 One of Ray's goats on a cold day a couple of years ago. Friends on twitter expressed their sympathies. Even more importantly, several wanted to help Ray figure out his next steps. 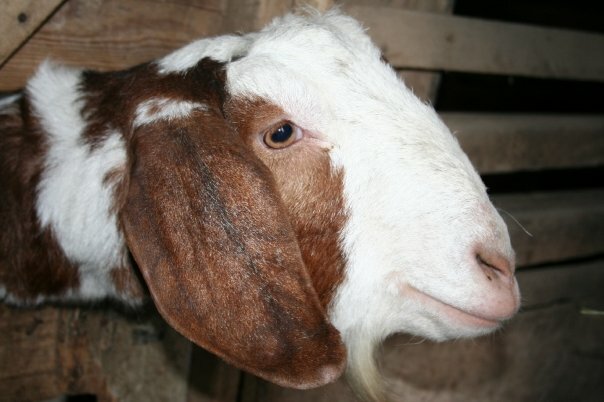 If he wanted to buy another doe, some ideas where to search and they helped as we were thinking through why the goat hadn’t been gaining sufficient weight, etc. Not only was I grateful for the help my friends in the twitterverse were offering, my brother was too. I’m betting he was a bit surprised too! As near as Ray & my tweeps can tell, the doe’s diet changes from when he purchased her this summer led to the weight/health issues she had. Those issues were masked by her weight gain during pregnancy. And that seemed to transfer to the kids. It was a tough day but sure is nice knowing Ray and a lot of others wanted to take time to figure out what happened, offer their expertise and try to keep animals healthy so the same problem doesn’t happen again. Mom getting a tour of the barn & meeting some of Ray's animals. It’s life on a farm with animals. I don’t fret about killing them when ready, so that they become meat on the table. However, it is frustrating when you know, on the one hand, how dependent domesticated animals on their farmers and, on the other, how much nature really calls the shots, so that sometimes once you learn what is wrong it is difficult to change directions for the sake of the animals. I think my problem is buying breeding stock from farms where they fed mostly commercial feed and then trying to raise them on pasture, hay, and various forages and root crops from the garden. I really want to raise them on what I can grow on the farm and that works for some of the stock, but not for others. Anyway, I do appreciate the offers of help, etc.